The culprit? A short-sighted decision to remove a critical piece of security hardware from Chicago’s docking stations. "As of August 26th we only have seven bikes missing for a long period within all our systems around the world, when the number is over 500 in Chicago alone!" For want of a nail, the kingdom was lost," goes the old proverb. So too, it turns out that an ongoing citywide epidemic of Divvy bike thefts is the result of a short-sighted decision to remove a small but critical piece of security hardware from Chicago's docking stations. On July 12, after multiple reports of stolen cycles on social media (and five days of me pushing for answers from the bike-share network and the Chicago Department of Transportation, which oversees the program), Divvy finally sent me a statement acknowledging that it had experienced "a recent series of thefts from stations." I was assured that it was "retrofitting all [its] docks with stronger, more tamper-proof lock mechanisms." In late August the crime blog CWB Chicago reported that, while there were only seven adult arrests for possession of stolen Divvies during the first half of 2018, there was a massive spike in arrests this summer, with 120 cases between July 1 and August 16 alone. Last week when I asked CDOT and Divvy for an update on the theft problem, Divvy general manager Michael Critzon e-mailed me the exact same statement I was sent more than two months ago, suggesting that the situation is under control. But CDOT e-mails I obtained via a Freedom of Information Act request tell a very different story. The messages indicate that hundreds of cycles have gone missing—a problem unique among docked bike-share systems in major U.S. cities—due to the missing security component. One transportation official characterized the wave of thefts and "crimes committed on stolen Divvy bikes" as potentially catastrophic, calling it "an increasingly serious crisis." This summer local news outlets have been quick to point when robberies, assaults, and shootings have been reportedly committed by people riding the blue bikes. The e-mails show that city officials are worried that the relative ease of stealing Divvies is facilitating crime. For example, on July 27, after a man on a Divvy snatched a woman's purse in the South Loop, an assistant to Fourth Ward alderman Sophia King wrote CDOT to ask what’s being done to combat thefts. "Individuals have found a way to [steal] the Divvy bikes from their stalls," the staffer wrote. "Due to this we are seeing them used for crimes and [abandoned bikes] are filling up our community since there is no incentive to return them to the station." And the e-mails show that in late August 27th Ward alderman Walter Burnett called CDOT after a man sexually assaulted a woman in his west-side ward and fled on a Divvy. Unlike the dockless bike-share cycles that are currently being piloted on the far south side, Divvies don’t have onboard GPS, and Burnett asked whether Divvy could be required to add this feature to make it easier to track down stolen bikes. In a subsequent e-mail exchange, transportation chief Rebekah Scheinfeld asked assistant commissioner Sean Wiedel, who oversees the Divvy program, and CDOT consultant Amanda Woodall, who works on bike-share policy issues, why GPS hasn't been installed on Divvies. Woodall responded that while real-time tracking of each bike's location would help locate cycles after they've gone missing, "we wouldn't have the capacity to launch investigations on each bike and prevent crimes from being committed with them. The way to solve this problem is to prevent thefts in the first place." But an August 30 exchange between Wiedel and staff from Montreal-based PBSC Urban Solutions, which provides the bikes and stations for Divvy, shows that the dock security upgrades weren't happening fast enough. "Chicago has experienced a major increase in bike thefts this year that has led to a lot of bad press and other cascading issues including crimes committed on stolen Divvy bikes," assistant commissioner Weidel wrote. "Quite frankly, this problem makes the city of Chicago, the Divvy system, PBSC and Motivate [the parent company of Divvy] all look bad." He said Divvy employees had been "working hard" to install an additional security hardware component inside the docks. But, he complained, "working on a solution is a cost and drain on Divvy staff resources, and the sheer number of missing bikes make it very difficult to effectively run our system." Wiedel added that in addition to the hardware fix, the Divvy team told CDOT that PBSC had development a "firmware" (software that provides the low-level control of a device's hardware) solution for the docks. He asked the company to commit to adding the firmware to all Divvy stations, and insisted that CDOT would not pay for the parts and labor needed to address "this increasingly serious crisis." Luc Sabbatini, the CEO of PBSC, fired back that the Divvy program had been mismanaged. "The Chicago situation is unique to Chicago," he wrote. "We do not have issues with missing bikes anywhere else, including Brazil, which could be the toughest market in the world. As of August 26th we only have seven bikes missing for a long period within all our systems around the world, when the number is over 500 in Chicago alone!" If that figure is accurate (CDOT and Divvy declined to estimate the number of missing bikes), it would represent more than 8 percent of Divvy’s fleet of about 6,000 bikes. Since each cycle costs the city $1,200, that’s $600,000 worth of taxpayer-funded hardware. However, per Chicago’s contract with Divvy, the city is only responsible for the replacement cost of up to 1 percent of the total number bikes purchased. That's 60 cycles, or $72,000. Sabbatini maintained that the Chicago theft wave "has nothing to do with firmware, software, or PBSC equipment." Rather, he argued, the failure of docks was due to a lack of station maintenance, combined with the Divvy team’s previous decision to remove the security component from the docks that is now being reinstalled. "As soon as we have noticed the situation, we had someone from our team verify and audit the locking mechanisms in Chicago," Sabbatini wrote. "Our recommendation was crystal clear at the time and has been constant since then: reinstall the [component] on all stations. From our understanding the current pace is only one station per day, which is not sufficient." Indeed, Divvy currently has 570 stations, and it's installing 36 more this fall, so at that rate it would take the better part of two years to complete the work. Sabbatini agreed to install the firmware on all stations, but maintained that it would be useless for stations that still lack the crucial security hardware. 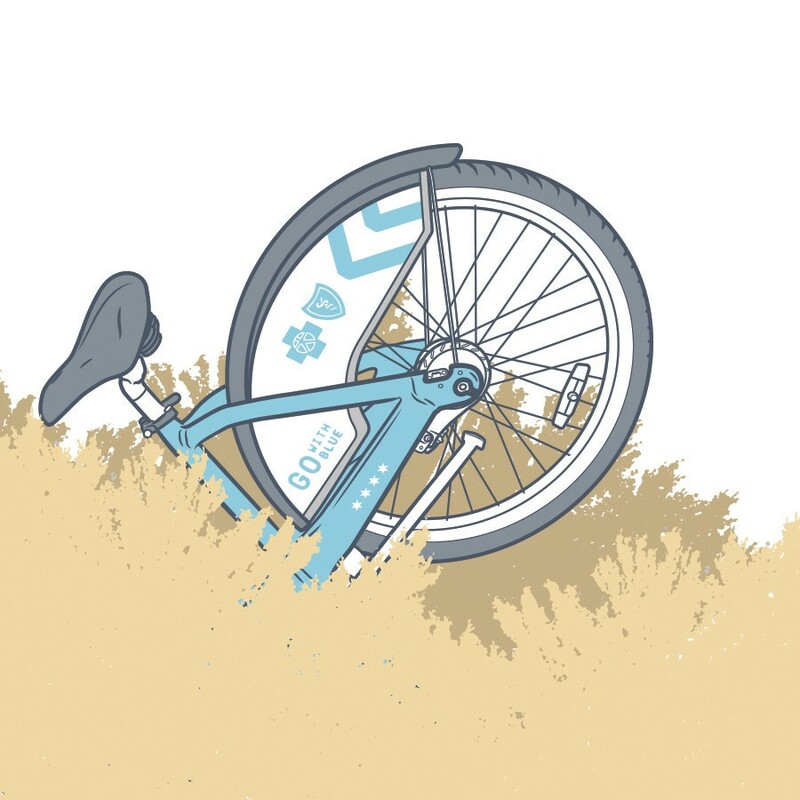 "We are in constant communication with Divvy to help, but our message has always been the same: fix the [component] and follow our documentation and recommendations on proper maintenance." So why the heck did the Divvy team remove that security hardware component in the first place? "I think it was done to make it easier to dock the bikes," said a person familiar with the bike-share industry who requested anonymity. "In the early days of Divvy, you had to really slam the bikes in, so the bikes often weren’t docked properly. Removing the [component] made docking easier, but it also made it easier to steal bikes." Former Chicago and Washington, D.C., transportation chief Gabe Klein, who launched both cities' PBSC hardware-based bike-share systems, told me he didn't recall the security components being removed from Divvy docks while he was at CDOT. 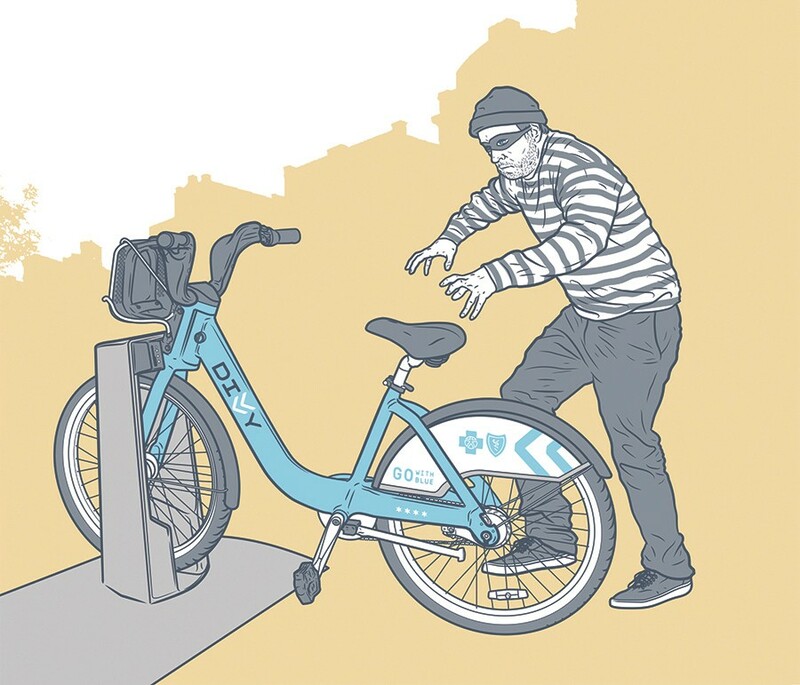 However, when I described the method people are using to steal bikes in Chicago, he recognized it as the same technique used in a spate of thefts from D.C.'s Capital Bikeshare system when it debuted in 2010. The CaBi docks previously lacked the components, but quickly installing them in all stations solved the theft problem, Klein said. Last week sources at CDOT and Divvy told me PBSC has added the firmware to all Divvy stations, and that the pace of reinstalling the dock components has accelerated and should be completed by the end of this year. They said PBSC and Divvy have agreed that the city won't be on the hook for the related costs. Income from ads, sponsorship, and operations was up while losses were down. FOIA'd documents show the $41 million project has had only a modest impact on bus speeds. While dockless bike share is experiencing growing pains or worse in other cities, records show that DoBi providers LimeBike and Pace are doing decently.